Do you manage, lead or work with a person who is methodical and organized in thought? They value systems of approach, versus off the cuff thinking. Do they tend to go quiet during tension? You are probably working with an Analytical. 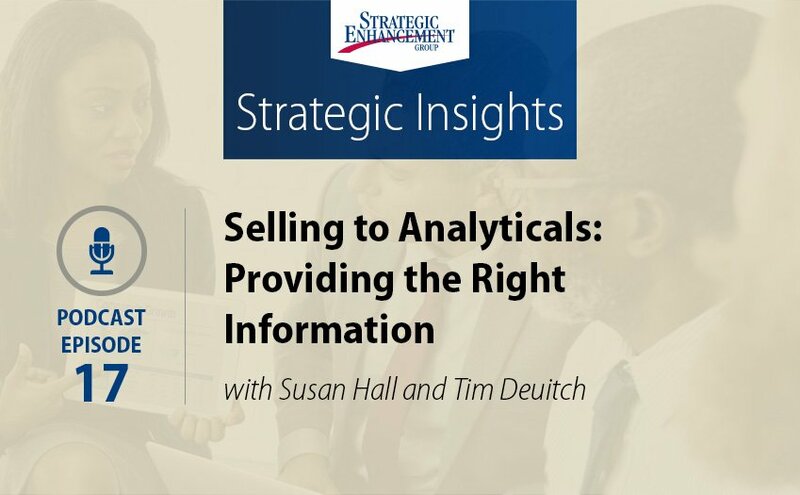 In Episode 18 of Strategic Insights, Tim Deuitch and Susan Hall share strategies for identifying, working and leading Analyticals for improved performance through increasing your Versatility. Tim Deuitch: 0:01 Hello and welcome to the Strategic Insights Podcast brought to you by Strategic Enhancement Group. 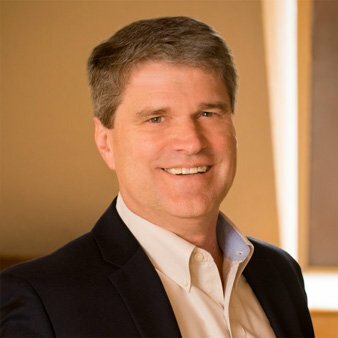 I'm Tim Deuitch, Senior Performance Consultant, and today I'm joined by Susan Hall, Vice President Business Development & Performance Improvement. Welcome, Susan. Susan Hall: 00:17 Hi Tim. Great to be here. Tim Deuitch: 00:19 Great to have you. This podcast is one of a series that addresses the challenges we feel when working with clients and coworkers that have their own unique communication styles and there are four styles we'll speak through. First, is the Analytical style. The Analytical style is task focused, deliberate, thoughtful, and they prefer process, and that's today's style that we'll examine. The other three styles are the Expressive, they're people focused, they're verbal, they think out loud, they're creative and demonstrative. Then there's the Amiable style, that's a people focused person who's diligent, they prefer harmony and collective input, and fourth is the Driver. They are task and results oriented, and they get to the point, and they use their time wisely. Each of our podcasts addresses one of these styles, and as I mentioned today, we're going to talk about the Analytical style, and more specifically, the analytical coworker or employee. 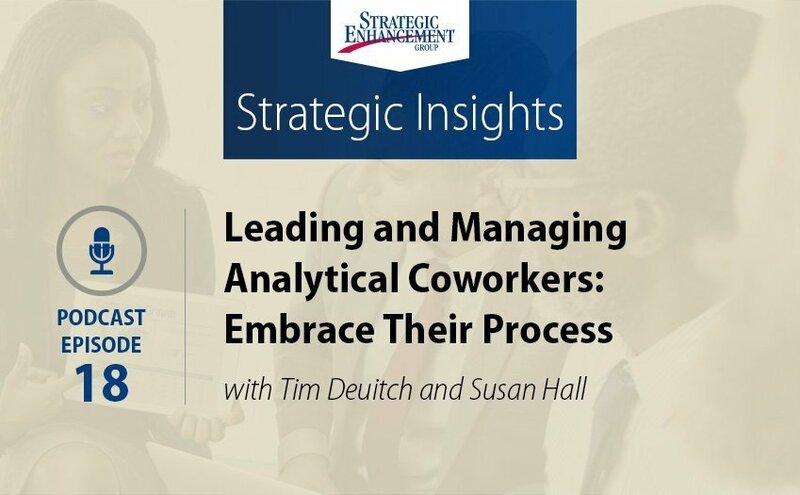 We'll start with the characteristics of the Analytical style, and then we'll share several practical tips and action steps that you can take to interact more effectively with your Analytical coworkers. We'll also look at typical misconceptions or the things that frustrate them, we'll talk through all of these. So, let's start with typical behaviors. Analyticals are task and process people. They place high value on thinking things through. They tend physically to have a flat affect, meaning they often use few facial or hand gestures while they listen intently to a conversation, and they tend to influence others by asking questions, versus making declarative statements. They're methodical and they're organized in thought, they value systems of approach, versus off the cuff thinking. Susan, what are some of the other behavioral cues you might see from an Analytical? Susan Hall: 02:27 Accuracy and getting it right the first time is very important. Analyticals hate being wrong. They're thoughtful and they often need time. That could be minutes or a few days depending upon the gravity of the decision, to make a decision or to express their opinion about a critical concept. It's not about being slow. In fact, some of my Analytical coworker friends have told me that word kind of irritates them. It's more that the way they think, is they think through different scenarios, "Well, if this happens, then this could be the result, but if this happens, then this could be the result." So, they really want to think through different scenarios in a logical fashion before they weigh in on something important. Tim Deuitch: 03:19 It's important to think about that thoughtfulness, that natural thoughtfulness as a strength. They actually can help impulsive doers, coworkers who were just, "Let's get to it." They help them stay grounded. But, just the same, let's look at frustrations. There can be elements around Analytical coworkers that frustrate us, and one such tendency that they have is when they're under stress, they can avoid or withdraw from a situation. Sometimes it's right when you want them to make a decision or weigh in on an important dynamic. They avoid the moment, they can become quiet, sometimes literally go back to their office and close the door. Right, Susan? Susan Hall: 04:12 Absolutely. I've learned that silence from an Analytical is not necessarily a bad thing. Some of the tell-assertive styles like Expressives and Drivers feel this need when an Analytical goes silent, to just jump in and fill the silence, when the reality is, they may just be thinking about the right response. So, it's important to remember with Analyticals that when you ask a question, wait. It may seem like forever for an Expressive or a Driver when in actuality it's probably only been a few seconds. I'm linking it, kind of to hitting the button on an elevator. It's like, come on, come on, come on, come on. The more you hit it, it's not going to bring that elevator up any faster. Same with Analyticals. If you just pose a question, let them think about it. You'll certainly get a good response. Tim Deuitch: 05:09 That leads to a misconception, which is, the Aanalytical coworker is slow. "It takes him so long to come to a decision," it's a far more respectful assessment to say, "Well, they're deliberate, they're thinking things through." Would you agree? Susan Hall: 05:31 Absolutely. I think another misconception is that, because Analyticals like data and they want to make decisions based on facts and logic, that they're not creative. When again, that's not true. If you give an Analytical the vision, as well as what you're trying to accomplish, and give them time to think about it and help them with the answers that they need, they can come up with some really incredible work. Tim Deuitch: 06:04 Yes, I agree. So, let's talk about specific actions and tips you can take when you're working with an Analytical coworker. First, and this is so important because it speaks to their personal motives. They're motivated by respect. They want you to respect them and they want to earn that respect by making good sound decisions. This is one of the reasons why you see them being so thoughtful. To them, it means you give them time to think things through. Respect to them is giving them time, and that you avoid putting them on the spot for speedy responses. In fact, say it out loud, "I'm not going to put you on the spot. I'd actually like you to think this through." They'll look at you directly and nod, and appreciate that. Another is their pension for process. Embrace this process thinking. They can be very helpful in helping you think through the important steps of a project or a process. They can help you see gaps or potential flaws in it, so embrace that. Another one, I would say, avoid putting them on the spot. But, another reason, not just respecting them, is that they are far more productive when you ask them to think something through and send you a response later. You'll get a better answer by not putting them on the spot. Tim Deuitch: 07:39 So Susan, what other thoughts do you have? Susan Hall: 07:42 They like to be prepared. So, as you said, sending them an agenda well in advance will help them prepare for a more productive meeting. Unlike some of the other styles, your Analytical coworker will probably actually read the materials that you sent in advance. I think, agree on scope and timing for any kind of a project that you're working on with an Analytical coworker. So as an example, one of my Expressive clients actually was working with one of her colleagues and coworkers, who happened to be Analytical, and asked her to create a document. Her vision was a one pager that would take maybe an hour to create. Unfortunately, she didn't communicate that to her Analytical coworker, and when she checked back in after a couple of days to check in on progress, her coworker was working on a six page excel spreadsheet that had taken her hours to complete. It was brilliant, but it was overkill for what the project required. So, who owned that disconnect? In this case, it was both of them. So, being sure to agree on timing and deadlines upfront, how you'll check in on progress, it's important with all styles, but I think it's especially important with Analyticals, because their sense of the time required to do the thorough job that they want and need to do, may be a little bit different from some of the other tell-assertive styles. Finally, when coaching and working with colleagues of the Analytical style, it's important for them to grasp the reason and logic behind your decisions. So, whether you are allocating resources, or you're promoting, or you're maybe, not offering up a project that they want to be involved in, whatever the interaction tends to be, make sure that they know how you've arrived at your decision. Better yet, ask for their input in advance, give them time to respond, but let them know that this has been a carefully, well thought out process. 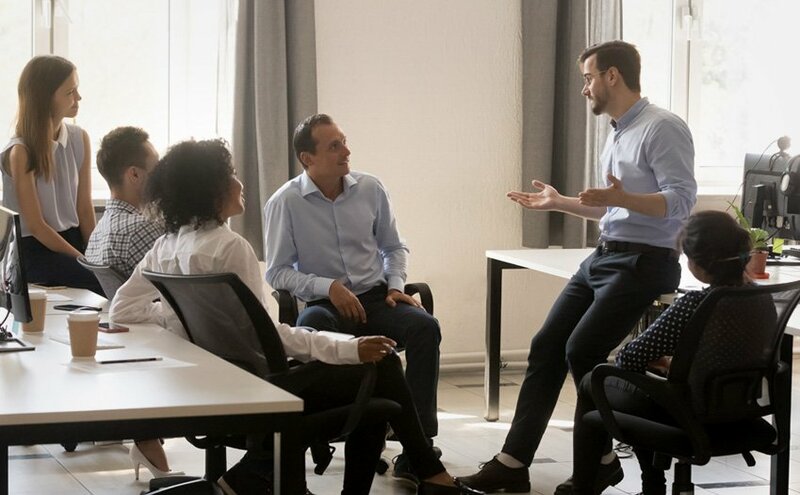 And, when you recognize an employee or a colleague who's Analytical, make sure that you do so, one on one or in their direct team, and that you're respecting the work that they do, rather than a lot of fanfare. Tim Deuitch: 10:10 The important word on that is demonstrating respect for what they've done, as opposed to sort of glitzy recognition, that's not the interest. Their sense of being recognized is that you acknowledge the work they put in, and the sound decisions, right? Susan Hall: 10:28 Yes. For some styles, a ticker tape parade is not too much, not for the Analytical. Tim Deuitch: 10:36 No, lots of great tips. So, in summary, Analyticals are task and process people. They tend to be thoughtful, they can be quiet during this thoughtful process, they don't think out loud, and they like to have a full understanding of a situation or a meeting before weighing in. So, our focus is to help them, by giving them time to prepare and get their questions answered in advance if you can. They value systems. So, they'll talk about systems within the office, and they get concerned about results if the system doesn't feel buttoned down to them. They want to be respected for their organizational abilities. They love data and research, the reason is, because it validates their input in their thinking. In short, give them the information and the time to process it, and you will love the results. Well, we've just scratched the surface today. So, if you have additional questions or thoughts, please visit us at StrategicEnhancement.com.